The first rule for Weekend Powder Warriors is to avoid the holiday hordes so Christmas or New Year weekends are a big fat no. Then half term in Europe, especially France, takes out three weeks in February and one in early March. If you go to any Alpine resort during these times for slack or sidecountry (except Italy where it's often less manic) then you'll be elbowed by piste punters in the endless lift queues and overtaken by 14 year old freeride groms in the powder bowls. So January and mid to end of March are good times to consider thus narrowing potential weekends down to around six or seven for powder - although April's usually good for ski touring and spring snow weekends. 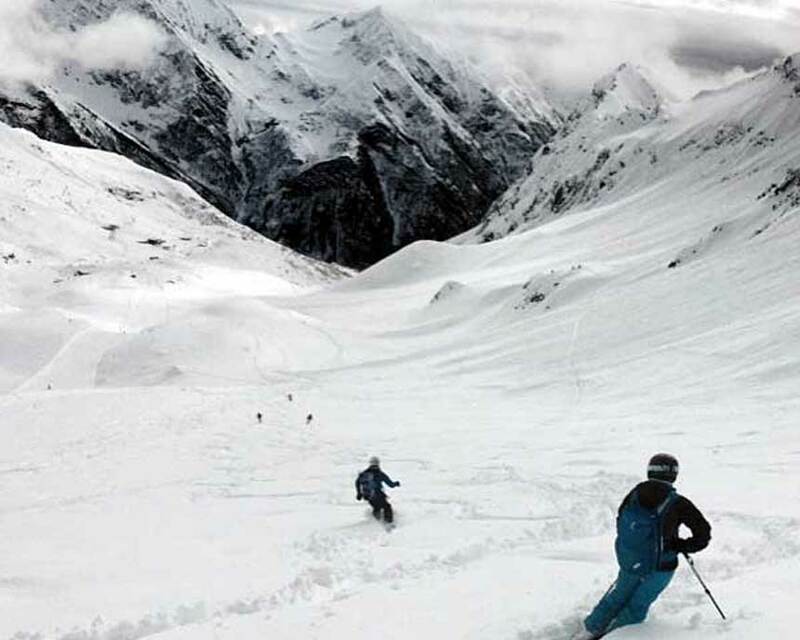 Easter is late in 2019 starting on Friday 19th April - if there's still snow, freeze at night and thaw during the day it could be an excellent ski touring long weekend choice especially as many Europeans have stored their skis and are getting out the Lycra for cycling or basking on the beaches at this time of year. There are, also, the three weekends before Christmas when the lifts are open and resorts are empty but it all depends on whether the snow gods choose to deliver an early Christmas present. Also when does your weekend start? Presuming you can add a workday or two to make it a long weekend then consider going when travel is less expensive from Sunday to Wednesday. On the other hand starting your weekend on Wednesday of Thursday means you'll have more chance of first tracks pre-weekend if it snows (see below) rather than competing with the locals or skiers from nearby cities coming up for Saturday and Sunday. Taking off the Monday or Tuesday instead after it has snowed over the weekend could just leave you with the trashed leftovers. And, yep it's true, seasonaires usually have Thursdays off but we all know that most will be too hung over from extended apres on Wednesday night to make it to an early Thursday morning pow party. Choose your warrior comrades carefully. Don't take the guy from the pub who overheard your plans and wants to join in unless you know he's a mountain guide or similarly guaranteed to be cool in deep pow. Also make sure your mates can take the time off potentially at short notice and are not likely to bail at the last minute especially if you are sharing the costs of accommodation, guide or car hire. With a group you can get better deals from tour operators who specialise in long weekend ski trips and give discounts for six people or more. They can take a lot of the hassle out of the trip by arranging flights, accommodation, transfers and guides. They also have staff on the ground in resort who just might, given a beer or two, share their secret powder stashes with you. As in any foray, though, a small raiding party is often better than a large battalion. With six or less Weekend Powder Warriors you'll definitely get more first tracks. Also, any more than six in your group and you'll need another mountain guide. And do not invite a faffer. Time is too precious as a Weekend Powder Warrior to have to wait for one of your group to find their gloves/goggles/transceiver. See how Robert de Niro deals with faffers in The Faff Factor and how to avoid it. It doesn't matter how good the deal is, if it's going to take you a day to reach your gite in the backcountry or the hotel in resort then you're losing valuable pow-slaying time. It's a misconception that all ski holiday operators only do weekly bookings. 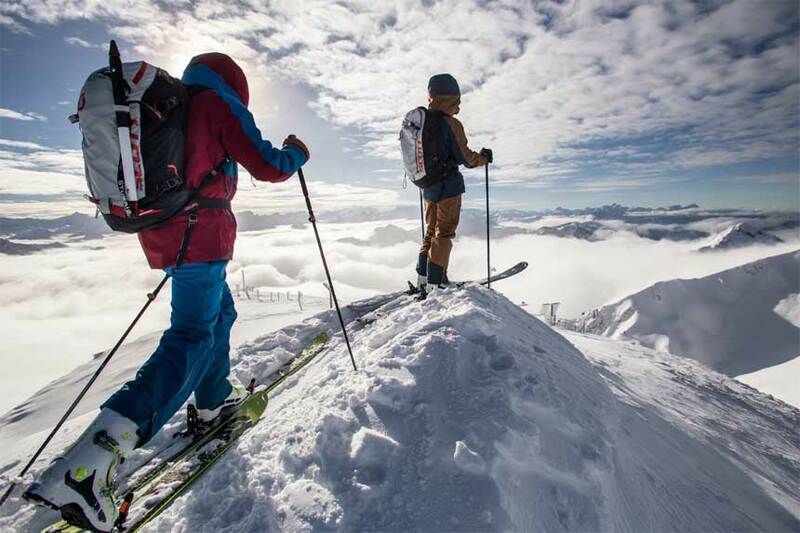 The demand for shorter ski breaks with mid-week arrivals or departures is being met by more ski travel companies with even catered chalet accommodation that's no longer Saturday to Saturday. So letting a short break ski tour operator with experience in creating weekend trips do it all for you can save all the hassle of organising travel, transfers and accommodation. It is therefore, cost and, more crucially, time effective. You could be in your resort just four hours after take off. Yes, four hours. Thanks to transfer efficiency, ski short breaks specialists can help you reach some of the best European resorts for powder just four hours after jetting along the runway in the UK. So fasten your seat belt, you'll be getting face shots in less time than it takes the French to fill their faces with lunch. Of course, it is dependent on airport strikes, accidents and, yes ironically, too much snow on the roads. Obviously it makes time-saving sense to fly to one of the most convenient airports for quick snow access such as Geneva, Innsbruck or Turin reaching more snow sure higher resorts. 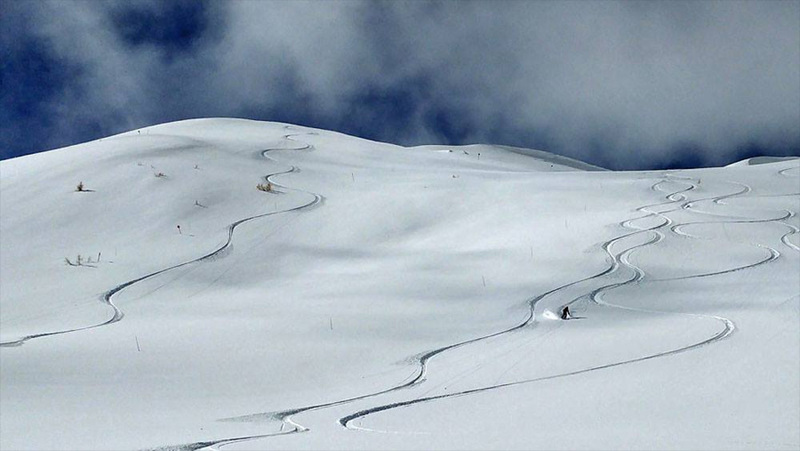 But, with a mountain guide you can avoid the freeride flocks who migrate to Chamonix and discover more off-radar locations like the Gressoney (image below) knowing that, even if the snow dump doesn't deliver, most guides can still sniff out stashes of perfect pow. 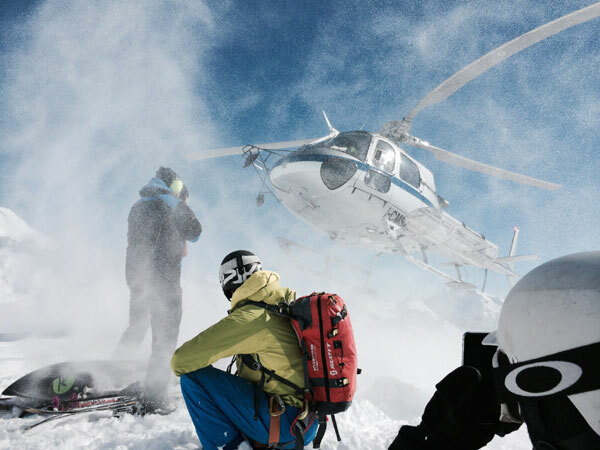 And, then of course, there are helis, the quickest way to the best snow away from the pow-stomping crowds, great if you only have the weekend and pockets as deep as the snow you're chasing. But that rules out France where heli-skiing is banned. The weather forecast sites such as MeteoFrance and Snow Forecast can give a pretty good idea 10 days ahead of storm patterns and potential snowfall. Then there are resort webcams and local blogs for keeping an eye on conditions for daily updates. We particularly like We Powder at STYLE ALTITUDE, a snow forecast site that gives powder alerts for over 800 ski areas in the Alps, where you can track potential nuking in any of the resorts you're considering for the weekend. It's free for the regular six day view but you can upgrade for their 14 day forecast. So you can tentatively book time off and clear your work two weeks in advance if it looks like there's snow coming. But if you can make the call closer to the actual weekend, then even better. Much as we all love a good deal and to save money, the cheapest is not necessarily cost effective when it come to short ski breaks. However, owing to their unholy anti-social departure times some of the cheapest flights actually happen to be the best for Weekend Powder Warriors. Leaving eye-wateringly early or mind-numbingly late at night, fits in perfectly with getting to or from your destination without wasting valuable ski or snowboard time. But don't think of reducing travel time even more by only taking hand luggage unless you have your own place in the snow (in which case skip to Rule 7). Hiring kit in resort is just more time wasted. We nearly left out the driving option because of, well, all that time driving. It works, though, if you do it overnight with two or more of you taking it in turns to drive and sleep so you all arrive fresh and, after one espresso, ready to rock and ride. Big plus is lack of hassle taking all your kit - if you have a van or top box, that is - but downside is the fact you'll still feel that you've missed a night in bed, which is only a good start to a weekend if you intend to lie in it for at least half the next day. Finally, don't stint when it comes to booking mountain guides both for their knowledge of powder, see Rule 4, and because they'll keep you safe in the backcountry. Which is priceless..
What every Weekend Powder Warrior needs is just one weapon of choice for powder and easy weekend travel. It's one ski with downhill bindings if you're just doing sidecountry or touring bindings for slack and backcountry - unless you have the new Salomon Shift that does both. Obviously if you're a proper powderhead then the ski touring option is a no brainer because this is how you find the best untracked bowls and couloirs. There's a great choice of All Mountain and Big Mountain skis out there - but for the touring option a lightweight ski that's semi-fat for easier ascents at around 110mm rather than full fat 115mm is the perfect weekend powder weapon, such as the Black Crows' Atris 108s for men or the Nordica Santa Ana 110 for women. And bring stormriding gear. Yes we'd all love bluebird days, to be doing cold fresh pow in glorious sunshine but it ain't necessarily going to happen. You could find your weekend is exactly when the snow dumps. But don't take this as a negative. If you've ever skied or snowboarded in Japan you'll know that stormriding is obligatory especially in January to get that unlimited champagne powder. Therefore, stormriding kit is essential as in really good goggles with transitional or changeable lenses such as the Bolle Phantoms from OutdoorGB, waterproof shell and quality gloves, which is any of Black Diamond's Freeride range. Also do not stint on safety gear as in transceiver, shovel, probes and avy bag. Yep they might add baggage weight but see Rule 5, Deep Not Cheap, as this is one area you don't want to save money if it might save your life. The latest SCOTT Alpride E1 Airbag, above, doesn't even need cartridges so there's one less potential hassle checking in at the airport. So rent for the whole winter. We could have said BUY an apartment or chalet in the Alps but not if you're a Brit as, with Brexit, who knows whether this is a good idea, what newly invented Brit owning property Euro taxes you might be made to cough up? 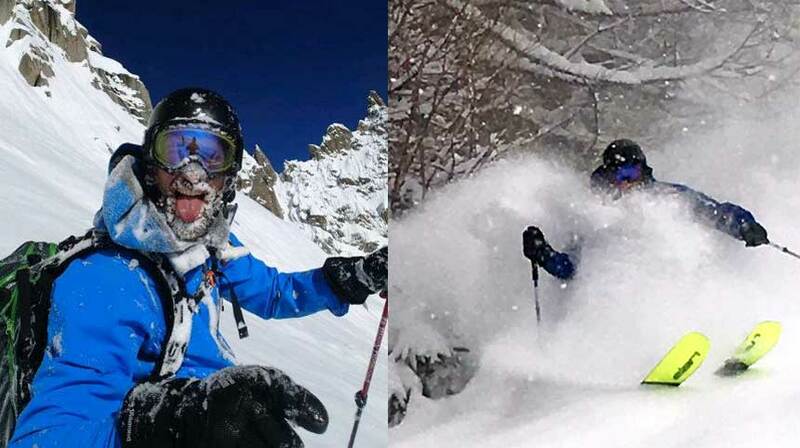 Our contributor, Jonathan 'Bing' Bingham (below image) who has a property development business in West Sussex has become the ultimate Weekend Powder Warrior by renting an apartment in Entrèves for the past two winters on the doorstep of the Skyway telecabin on the Italian side of Mont Blanc, entry to 'gnarvana' backcountry paradise (read our Skyway To Heaven feature) and close to Courmeyer. 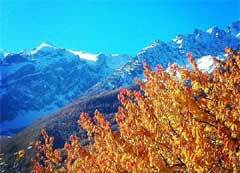 Even better it's only 75 minutes from Geneva airport. So come on Bing, how many weekends did you manage last winter, huh? 'With a little bit of planning, as in. pre-booked easyJet flights well in advance along with hire cars, it is possible to be in the mountains every other weekend', he says, adding with a slight smirk, 'I managed 49 days skiing last winter. '.